In large domains of theoretical and empirical linguistics, scholarly communication needs are directly comparable to those in analytical and natural sciences. Conspicuously lacking in the inventory of publications for linguists, compared to those in the sciences, are concise, single-authored, non-textbook reviews of rapidly evolving areas of inquiry. 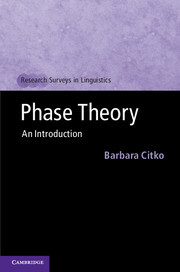 Research Surveys in Linguistics is intended to fill this gap. It consists of well-indexed volumes that survey topics of significant theoretical interest on which there has been a proliferation of research in the last two decades. The goal is to provide an efficient overview, and entry into, the primary literature for linguists – both advanced students and researchers – who wish to move into, or stay literate in, the areas covered. Series authors are recognized authorities on the subject matter, as well as clear, highly organized writers. Each book offers the reader relatively tight structuring in sections and subsections, and a detailed index for ease of orientation.